Poke is a Canadian Smash 4 player from Toronto, Ontario who mains Luigi in Smash 4, who is considered to be the best Luigi in Canada. He is known for being a "lab monster", testing out Luigi's combos and various ways to extend them, as well as certain character-specific KO set-ups on many of Luigi's finishers and low percentage to death combos. One of them in particular is called the Poke Combo after him. He uploads many of his combo demonstrations on his YouTube channel. Early on in his Smash 4 career, Poke also snagged notable wins on NAKAT, Ally and Mew2King. He is also notable for his talent at the Home Run Contest. Poke is currently ranked 5th and 6th on both the Southern Ontario Power Rankings for Smash 4 and Brawl, respectively. 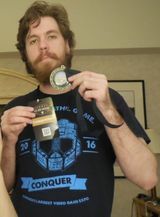 In doubles, he has made strides with his teammate Iceninja, able to defeat several big teams at tournaments like The Big House 6, where they placed 7th overall. This page was last edited on December 21, 2018, at 01:21.